Welcome to the Listening Room shop page. 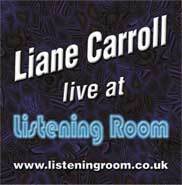 Liane Carroll was one of the first artists to appear at The Listening Room when the club was first launched at the beginning of 1999. Her commitment to the music, and unique inclusive humour made her an immediate favourite with the audience. This session was her second at the Club. After a quick chat with the house band, Liane turned in this stunning live performance, that we were very fortunate to record. I would like to thank Liane for all the support she has given The Listening Room, especially allowing us to release this memento of a wonderful night. Click here for a track listing, free samples and ordering information. If you have a product that you would like to offer to our customers please click here to contact us.